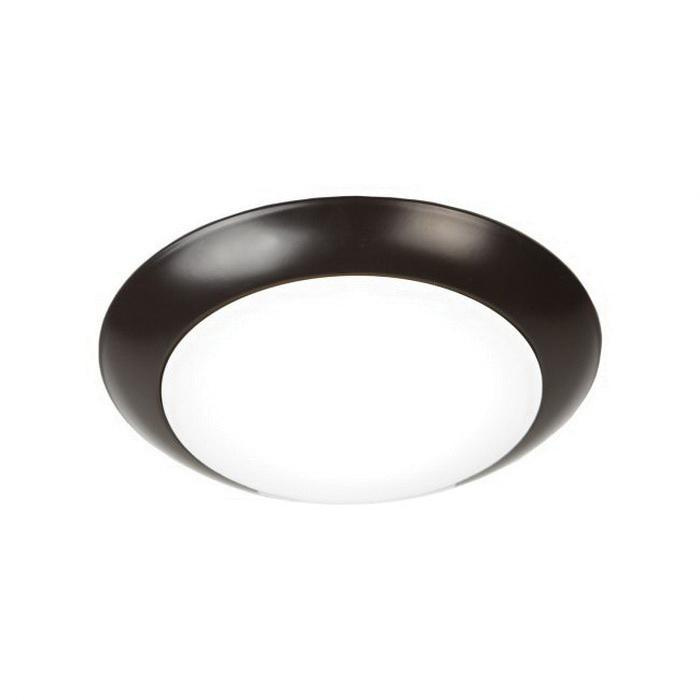 WAC Lighting LED light fixture features steel with white acrylic diffuser and bronze finish. This dimmable light fixture in disc shape, uses 15-Watt lamp that has voltage rating of 120-Volts. Lamp in the light fixture has color rendering index of 90 CRI and color temperature rating of 3000K to ensure optimal light level in the surrounding. Lamp has average life of 36000 hours. Lamp offers 1110-Lumens of bright light output. Light fixture comes with driver that uses 100 - 10% electronic low-voltage control signals to control dimming functions. Multiple LED array provides uniform illumination. It measures 7-3/8-Inch Dia x 1-1/4-Inch. Wall/ceiling mountable fixture withstands temperature rating of -35 to 50 deg C. Light fixture is CSA/CEC/Energy Star certified and ADA compliant.